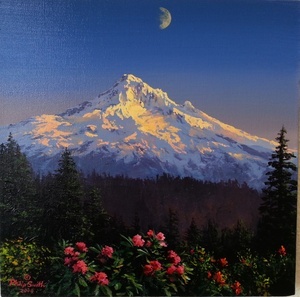 The people of the Pacific Northwest have waited a long time for a signature art auction and the wait is finally over. The inaugural auction is scheduled for Labor Day, September 1, 2014, and will be held at Urban Studio, a contemporary event venue located in the arts culture hub known as the Pearl District of NW Portland. The event will be held in conjunction with the popular Art in the Pearl Festival, which operates in the Pearl Park Blocks, a short walking distance from Urban Studio. Rip Caswell saw that the Pacific NW region of the U.S. was missing an art related event of such caliber, and so planning began on The Pearl Art Auction in order to fill that void. Expectations are that the event will draw buyers from the entire western states and that The Pearl Art Auction will become one of the west’s greatest art events. Visit the website for more information on how to register, submit art for consideration, and more! Rip Caswell is offering a unique opportunity for aspiring sculptor. Rip will coach and critique your creation from molding the clay to adding the patina. You will begin working in Rip’s Studio at Caswell Gallery in Troutdale and finish your piece at Firebird Bronze Foundry in Boring. Week 1: Design and sculpt at Caswell Gallery in under the guidance of Rip Caswell. Monday: Bring your idea and start to sculpt. 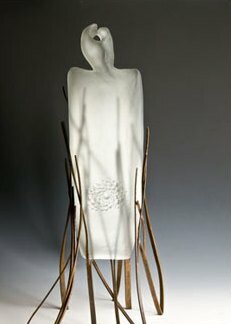 You will create your rough sculpture and refine your piece at home. Thursday: Rip will critique and help you to refine your piece for the foundry. Week 2: Gating, burn out and pour at Firebird Bronze Foundry in Boring. Monday: Our Foundry expert will walk you through the entire foundry process. You will then learn how to “gate” your piece and dip your piece in slurry and sand to create the shell. Thursday: You will watch your piece burned out from the shell and cast. Your piece may be cool enough to come out and be “chipped”. Some will be carried over to next week. Invite a friend or spouse. We will have a potluck (hot dogs and burgers on us) and watch the bronze pouring. Week 3: Chipping, sandblasting, polish and patina At Firebird Bronze Foundry in Boring. Monday: Our Foundry expert will demonstrate chipping and sandblasting. You will sand and polish your piece to get it ready for the patina. 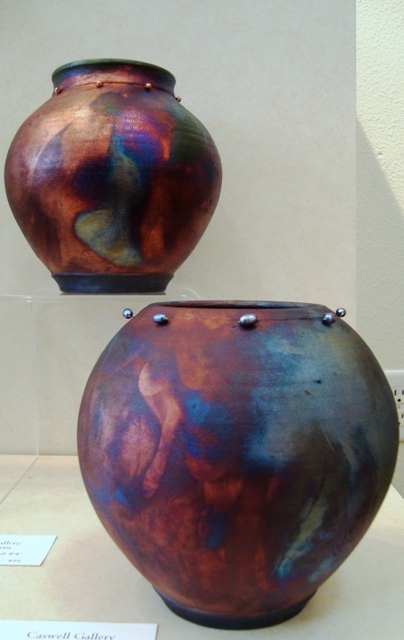 Thursday: You will apply a basic patina and complete your piece; attach a base (optional). You are now an experienced sculptor! If you want a base for your piece there will be an additional charge of $25. So Christmas is over — ahhh! Hopefully you were thrilled with all the gifts you received — and gave! If that was not the case, you must be hoping next year will be better. 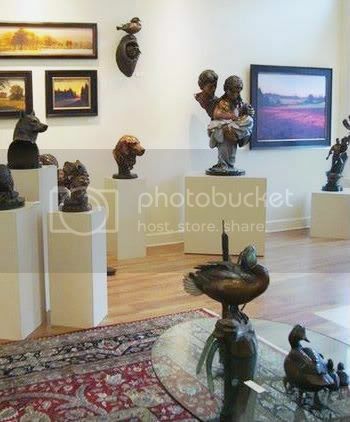 Of course at Caswell Gallery we believe there is nothing better to give, or receive, than art. Yes, it can be a bit chancy, but here are a few tips to guarantee your gift of art will be perfect for the person lucky enough to be on your “nice” list. If you’re an art lover, you probably try to buy gifts that reflect your appreciation for unique works of art. Because an art purchase will probably be a more expensive item than you are likely to purchase at a big box store, you want to feel you are selecting just the right piece for that special recipient. 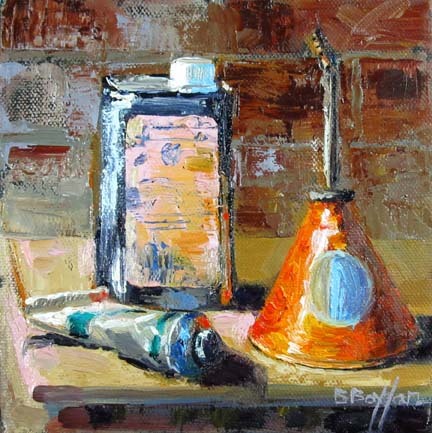 If you are shopping for a painting, it helps to know which painting your loved one covets. If you have that info, than you have no problem. If you arrive at the gallery and that particular piece is no longer available, be sure to confirm its sale. Ask if they can check with the artists to see if he/she has a similar piece in inventory. If not, consider selecting another painting by the artist, but perhaps go smaller. This way, the painting is likely to still work, but not be an unwelcome “commitment” by the recipient. If a painting is a bold move, consider something smaller. Perhaps a piece of pottery or art glass. These types of items are less expensive and can be a little easier to display and integrate into a decorating scheme. A small piece of sculpture that will inspire an emotional reaction will almost always be perfect. 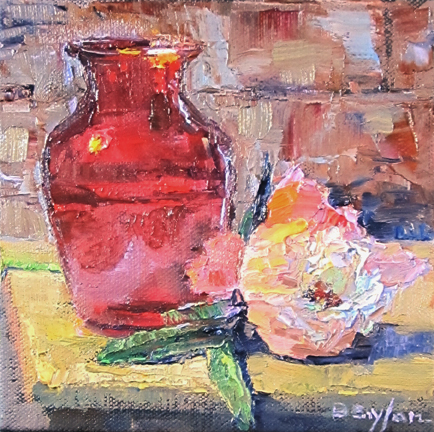 If purchasing artwork as a gift still makes you a little nervous, consider a book or note cards depicting the work of the preferred artist, a print reproduction, a blown glass “ornament” rather than the bowl or vase, or a utilitarian pottery object, rather than a larger statement piece. Even art jewelry can be displayed as well as worn. If you’re going in the opposite direction and plan on purchasing a large scale or very expensive piece of art as a gift, be sure to ask about the return policy. Often you will not be able to return your purchase for a refund, primarily because of the gallery arrangement with the artist. The gallery may have already paid the artist for their work, and refunding the money would not be possible. Exchanges may not be an option either, so it’s best to be as sure as possible about your purchase. Art can delight on the most subtle levels (and vice versa). Giving or receiving art can be the epitome of gift giving pleasure. Just make sure to consider the receiver’s taste and preferences, and make the best decision possible with that knowledge. Most likely you can’t go wrong if you consider these suggestions. And yes, Christmas may be over, but Valentine’s Day is a few short weeks away! 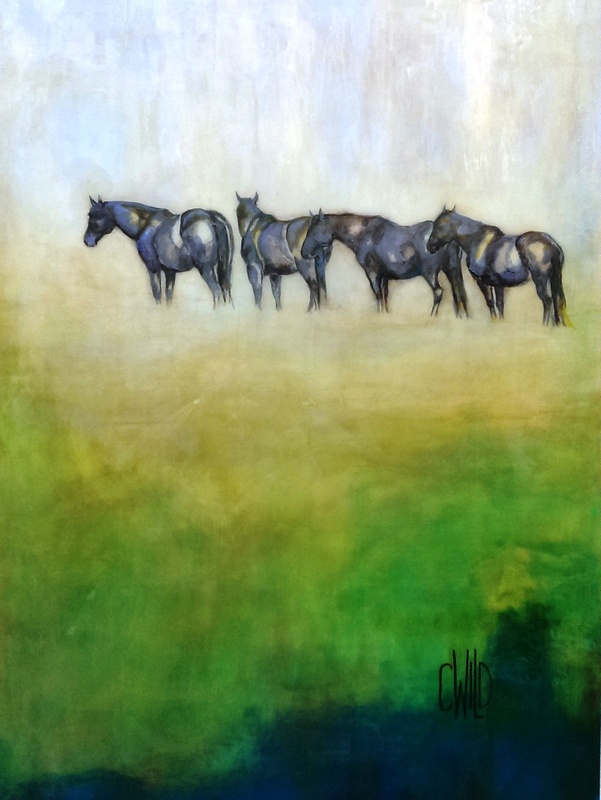 We now have some new paintings in the Gallery by Jackson Hole artist, Carrie Wild. 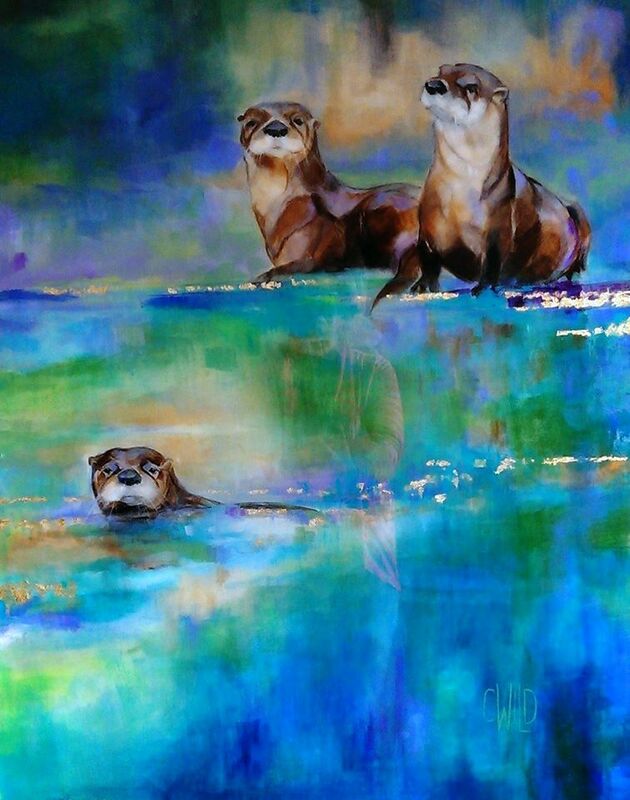 Carrie’s wildlife paintings are realistic, but have a very contemporary feel. She incorporates gold leaf and applies a hand-fired acrylic glaze which adds dimension and depth to her paintings. Come by the Gallery for a closer look. If you love wildlife work, but want something a little different, these might be perfect for you. Carrie was raised on a small horse farm in Southern Michigan where she learned to respect, appreciate and love animals from a young age. Her childhood was spent riding horses, exploring the forests in search of wildlife and competing in horse shows. Along with her love of nature she developed a passion for art early in life. She studied and experimented drawing with different dry mediums including graphite, charcoal, colored pencil and soft pastel. Through her knowledge of horses and wildlife she developed a strong drawing technique focusing on the anatomy and characteristics of each subject. Katie Hovis of Whimsy has a great selection of her gorgeous necklaces, bracelets and earrings. If you are still looking for just the right Christmas gift, come by and take a look at her jewelry. We like to share info on our artists and what inspires their work and process. In her own words, here is Katie’s story. 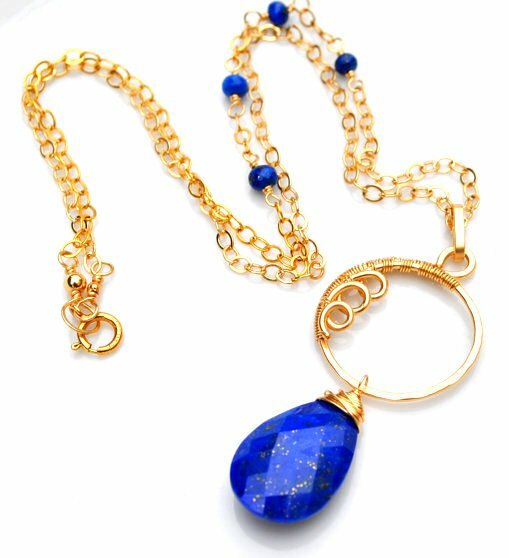 “Whimsy is my own line of unique, hand crafted wire and gemstone jewelry. I use hard to find semi-precious gems, natural jaspers and agates and combine them with hand forged sterling silver and 14k gold fill components — each piece is bound together with fine wire like an intricately woven tapestry — my process is akin to assembling a puzzle: I start with various basic shapes, pick out my stones and move them a round until they fit perfectly together, adding texture and other details as I see fit. 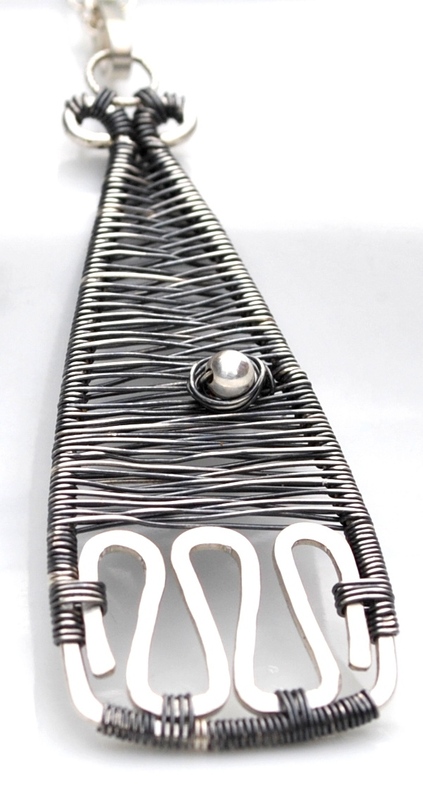 I use only “cold connection” methods, meticulously wrapping each little piece with my hands and an occasional set of pliers, using my trusty hammer to strengthen and shape the thicker metals. No torches, heat or treatments (aside from oxidization for a dark sheen on the silver). 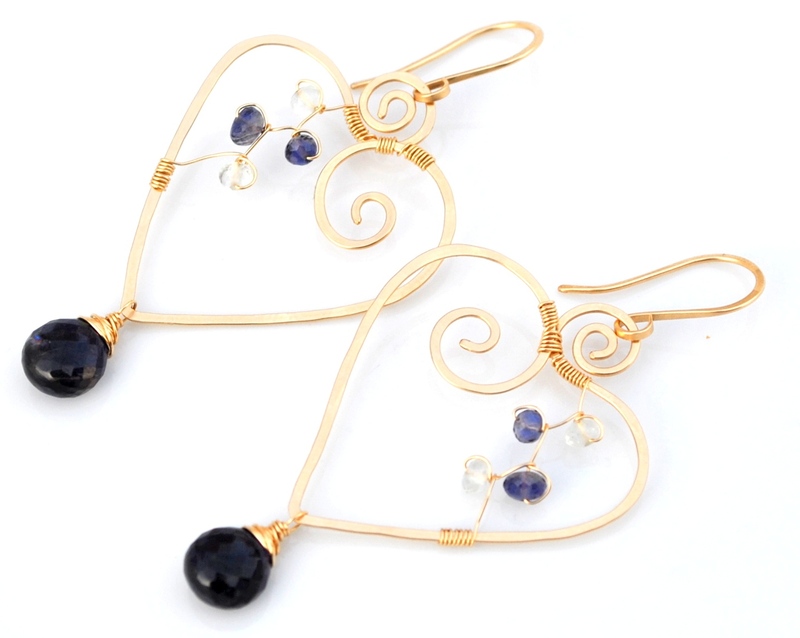 My current collection is inspired by love, nature, music and the spiraling, flowing forward motion of life. I am drawn to asymmetry and try to create balance in all my designs with color, movement and proportion. The right piece of jewelry can change your mood, your appearance and lift your spirits (much as music can) and I LOVE knowing that something I made with my own 2 hands is being worn and cherished long after it’s left my studio. It all began as a childhood obsession with agates and other stones for my prized rock collection. Family trips to the Oregon and Washington coast were spent digging in the sand, hunting for the perfect agate. After years of collecting, I became interested in the names and origins of each type and wanted to learn more… I am still discovering new types of gems and rocks to this day, and have a new favorite each week!